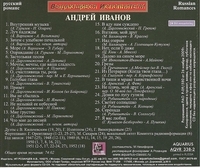 “From 1934 to 1950 Andreii Ivanov sang at the Kiev Opera House, and from 1950-1956 was commissioned to sing with Lisitsian at the Bolshoi. He is not at the height of Lisitsian, but nevertheless offers a very interesting singing with some excellent moments. Do not confuse this Andreii Ivanov with Alexeii Ivanov, another baritone from the same period (4 years younger) and is a pleasant surprise. It is one of those examples of disciplined baritone, trained in the golden years Bolshoi Theatre, and does it all with a tone of remarkable quality, far superior to that of pure committment."